A growing amount of evidence suggests that dental anxiety is associated with other psychiatric disorders and symptoms. A systematic review was conducted to critically evaluate the studies of comorbidity of dental anxiety with other specific phobias and other Axis I psychiatric disorders. The aim of the review was to explore how dental anxiety is associated with other psychiatric disorders and to estimate the level of comorbid symptoms in dental anxiety patients. The review was conducted and reported in accordance with the MOOSE statement. Data sources included PubMed, PsycInfo, Web of Science and Scopus. The search produced 631 hits, of which 16 unique records fulfilled the inclusion criteria. The number of eligible papers was low. Study populations were heterogeneous including 6,486 participants, and a total of 25 tests and in few cases clinical interviews were used in the evaluation processes. The results enhanced the idea about the comorbidity between dental anxiety and other psychiatric disorders. The effect was found strong in several studies. Patients with a high level of dental anxiety are more prone to have a high level of comorbid phobias, depression, mood disorders and other psychiatric disorders and symptoms. Keywords: Dental anxiety, Comorbidity, Anxiety disorders, Specific phobia, Psychiatric symptoms, Psychiatric disorders. © 2018 Halonen et al. Dental anxiety is a phenomenon that is seen almost every day in dental offices, and it can be a major challenge for both patient and a dental care provider. Between roughly one patient out of eight and one patient out of six reports, the level of fear that can be problematic in dental treatment [1Armfield JM. The extent and nature of dental fear and phobia in Australia. Aust Dent J 2010; 55(4): 368-77. [http://dx.doi.org/10.1111/j.1834-7819.2010.01256.x] [PMID: 21174906] -8Chanpong B, Haas DA, Locker D. Need and demand for sedation or general anesthesia in dentistry: A national survey of the canadian population. Anesth Prog 2005; 52(1): 3-11. [http://dx.doi.org/10.2344/0003-3006(2005)52[3:NADFSO]2.0.CO;2] [PMID: 15859442] ]. The level of experienced anxiety can vary from a tension that a patient can cope with to absolute avoidance behaviour. There is a great variation of tests used for measuring dental anxiety which may cause some difficulties in interpretation of the prevalence [5Locker D, Shapiro D, Liddell A. Who is dentally anxious? Concordance between measures of dental anxiety. Community Dent Oral Epidemiol 1996; 24(5): 346-50. [http://dx.doi.org/10.1111/j.1600-0528.1996.tb00874.x] [PMID: 8954222] ]. However, it can be stated that the fear of dental treatment is quite common among patients. Roughly two-thirds of the patients are women [2Locker D, Poulton R, Thomson WM. Psychological disorders and dental anxiety in a young adult population. Community Dent Oral Epidemiol 2001; 29(6): 456-63. [http://dx.doi.org/10.1034/j.1600-0528.2001.290607.x] [PMID: 11784289] , 6Heidari E, Banerjee A, Newton JT. Oral health status of non-phobic and dentally phobic individuals; A secondary analysis of the 2009 adult dental health survey. Br Dent J 2015; 219(9): E9. [http://dx.doi.org/10.1038/sj.bdj.2015.853] [PMID: 26564373] ]. Fear of dental treatment is described in both ICD-10 classification and Diagnostic and Statistical Manual of Mental Disorders, DSM-IV, in specific (isolated) phobias, a subgroup of anxiety disorders [9World Health Organization. The ICD-10 classification of mental and behavioral disorders Clinical descriptions and diagnostic guidelines 1992., 10American Psychiatric Association. Diagnostic and statistical manual of mental disorders (DSM-IV) 4th ed. 4th ed.1994.]. According to criteria, dental anxiety (phobia) is a phobia restricted to highly specific situations, although the contact with the phobic situation can evoke panic as in the cases of agoraphobia or social phobia [9World Health Organization. The ICD-10 classification of mental and behavioral disorders Clinical descriptions and diagnostic guidelines 1992.]. The person recognises that the fear is excessive or unreasonable and the phobic situation is avoided or else is endured with intense anxiety. Also, the avoidance or distress in the feared situation interferes significantly with the person’s normal routine, occupational functioning or social relationships [10American Psychiatric Association. Diagnostic and statistical manual of mental disorders (DSM-IV) 4th ed. 4th ed.1994.]. Patients with dental fear also show a number of other comorbid phobias: agoraphobia, social phobia and other specific phobias - fear of heights, enclosed spaces, animals, blood or natural phenomena [2Locker D, Poulton R, Thomson WM. Psychological disorders and dental anxiety in a young adult population. Community Dent Oral Epidemiol 2001; 29(6): 456-63. [http://dx.doi.org/10.1034/j.1600-0528.2001.290607.x] [PMID: 11784289] , 3Locker D, Thomson WM, Poulton R. Psychological disorder, conditioning experiences, and the onset of dental anxiety in early adulthood. J Dent Res 2001; 80(6): 1588-92. [http://dx.doi.org/10.1177/00220345010800062201] [PMID: 11499519] , 11Locker D, Shapiro D, Liddell A. Overlap between dental anxiety and blood-injury fears: Psychological characteristics and response to dental treatment. Behav Res Ther 1997; 35(7): 583-90. [http://dx.doi.org/10.1016/S0005-7967(97)00016-8] [PMID: 9193122] -13Tellez M, Kinner DG, Heimberg RG, Lim S, Ismail AI. Prevalence and correlates of dental anxiety in patients seeking dental care. Community Dent Oral Epidemiol 2015; 43(2): 135-42. [http://dx.doi.org/10.1111/cdoe.12132] [PMID: 25346261] ]. Further, dental fear is known to have a positive correlation with depression and mood disorders [2Locker D, Poulton R, Thomson WM. Psychological disorders and dental anxiety in a young adult population. Community Dent Oral Epidemiol 2001; 29(6): 456-63. [http://dx.doi.org/10.1034/j.1600-0528.2001.290607.x] [PMID: 11784289] , 3Locker D, Thomson WM, Poulton R. Psychological disorder, conditioning experiences, and the onset of dental anxiety in early adulthood. J Dent Res 2001; 80(6): 1588-92. 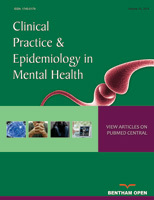 [http://dx.doi.org/10.1177/00220345010800062201] [PMID: 11499519] , 12Roy-Byrne P, Milgrom P, Katon W. Psychopathology and psychiatric diagnosis in subjects with dental phobia. J Anx Dis 1994; 8(1): 19-31. [http://dx.doi.org/10.1016/0887-6185(94)90020-5] ], alcohol dependence [4Smith TA, Heaton LJ. Fear of dental care: Are we making any progress? J Am Dent Assoc 2003; 134(8): 1101-8. [http://dx.doi.org/10.14219/jada.archive.2003.0326] [PMID: 12956352] ] and substance abuse [12Roy-Byrne P, Milgrom P, Katon W. Psychopathology and psychiatric diagnosis in subjects with dental phobia. J Anx Dis 1994; 8(1): 19-31. [http://dx.doi.org/10.1016/0887-6185(94)90020-5] ], and a variety of different psychiatric disorders [2Locker D, Poulton R, Thomson WM. Psychological disorders and dental anxiety in a young adult population. Community Dent Oral Epidemiol 2001; 29(6): 456-63. [http://dx.doi.org/10.1034/j.1600-0528.2001.290607.x] [PMID: 11784289] , 3Locker D, Thomson WM, Poulton R. Psychological disorder, conditioning experiences, and the onset of dental anxiety in early adulthood. J Dent Res 2001; 80(6): 1588-92. [http://dx.doi.org/10.1177/00220345010800062201] [PMID: 11499519] , 11Locker D, Shapiro D, Liddell A. Overlap between dental anxiety and blood-injury fears: Psychological characteristics and response to dental treatment. Behav Res Ther 1997; 35(7): 583-90. [http://dx.doi.org/10.1016/S0005-7967(97)00016-8] [PMID: 9193122] ] with a tendency that the higher the level of dental anxiety, the higher the presence of other comorbid phobias and disorders [2Locker D, Poulton R, Thomson WM. Psychological disorders and dental anxiety in a young adult population. Community Dent Oral Epidemiol 2001; 29(6): 456-63. [http://dx.doi.org/10.1034/j.1600-0528.2001.290607.x] [PMID: 11784289] , 3Locker D, Thomson WM, Poulton R. Psychological disorder, conditioning experiences, and the onset of dental anxiety in early adulthood. J Dent Res 2001; 80(6): 1588-92. [http://dx.doi.org/10.1177/00220345010800062201] [PMID: 11499519] ]. The comorbidity between dental anxiety and different phobias and disorders has been found in patients of dental clinics [12Roy-Byrne P, Milgrom P, Katon W. Psychopathology and psychiatric diagnosis in subjects with dental phobia. J Anx Dis 1994; 8(1): 19-31. [http://dx.doi.org/10.1016/0887-6185(94)90020-5] , 13Tellez M, Kinner DG, Heimberg RG, Lim S, Ismail AI. Prevalence and correlates of dental anxiety in patients seeking dental care. Community Dent Oral Epidemiol 2015; 43(2): 135-42. [http://dx.doi.org/10.1111/cdoe.12132] [PMID: 25346261] ], in a birth cohort study [2Locker D, Poulton R, Thomson WM. Psychological disorders and dental anxiety in a young adult population. Community Dent Oral Epidemiol 2001; 29(6): 456-63. [http://dx.doi.org/10.1034/j.1600-0528.2001.290607.x] [PMID: 11784289] , 3Locker D, Thomson WM, Poulton R. Psychological disorder, conditioning experiences, and the onset of dental anxiety in early adulthood. J Dent Res 2001; 80(6): 1588-92. [http://dx.doi.org/10.1177/00220345010800062201] [PMID: 11499519] ] and in a large population collected from volunteers [11Locker D, Shapiro D, Liddell A. Overlap between dental anxiety and blood-injury fears: Psychological characteristics and response to dental treatment. Behav Res Ther 1997; 35(7): 583-90. [http://dx.doi.org/10.1016/S0005-7967(97)00016-8] [PMID: 9193122] ]. Other specific phobias (besides dental phobia) can precede anxiety disorders or depression [14Schatzberg AF, Samson JA, Rothschild AJ, Bond TC, Regier DA. McLean hospital depression research facility: Earlyonset phobic disorders and adult-onset major depression. Br J Psychiatry 1998; 173: 29-34.-16Trumpf J, Margraf J, Vriends N, Meyer AH, Becker ES. Specific phobia predicts psychopathology in young women. Soc Psychiatry Psychiatr Epidemiol 2010; 45(12): 1161-6. [http://dx.doi.org/10.1007/s00127-009-0159-5] [PMID: 19888542] ]. Also, in general, anxiety-related disorders have high comorbidity with depression and mood disorders, or alcohol/substance use disorder, and vice versa [17Kaufman J, Charney D. Comorbidity of mood and anxiety disorders. Depress Anxiety 2000; 12(Suppl. 1): 69-76. [http://dx.doi.org/10.1002/1520-6394(2000)12:1+<69::AID-DA9>3.0.CO;2-K] [PMID: 11098417] -19de Graaf R, ten Have M, Tuithof M, van Dorsselaer S. First-incidence of DSM-IV mood, anxiety and substance use disorders and its determinants: Results from the netherlands mental health survey and incidence study-2. J Affect Disord 2013; 149(1-3): 100-7. [http://dx.doi.org/10.1016/j.jad.2013.01.009] [PMID: 23399481] ]. Some clinical symptoms of anxiety and depression can overlap [20Baldwin DS, Evans DL, Hirschfeld RM, Kasper S. Can we distinguish anxiety from depression? Psychopharmacol Bull 2002; 36(Suppl. 2): 158-65. [PMID: 12490832] ], suggesting a common neurobiological basis of the disorders. However, there has been no neurobiological research on these conditions in (primary) dentally fearful patients. Traditionally, dental anxiety is seen as a separate, independent fear caused by bad dental experiences. The studies about “separate” fear are well-presented in literature, while a number of studies about the comorbidity of dental anxiety with psychiatric disorders are quite low. No previous systematic review of comorbidity between these exists. In this study, we systematically collected previous studies of dental anxiety and comorbid (specific) phobias and other psychiatric symptoms and disorders. The aims of this systematic review were to i) explore how dental anxiety is associated with other psychiatric disorders in adult dental anxiety patients ii) estimate the difference between comorbid diagnoses and /or the severity of symptoms between the anxiety patients and controls iii) estimate associations of dental anxiety symptoms with comorbid symptoms in any adult patients and any adult populations. Due to various terms used to describe fear over dental treatment in previous literature, we now use one single term, dental anxiety to mean the subject of interest regardless of the term used in the original article. This present study protocol followed the MOOSE [21Stroup DF, Berlin JA, Morton SC, et al. Meta-analysis of observational studies in epidemiology: A proposal for reporting. Meta-Analysis Of Observational Studies in Epidemiology (MOOSE) group. JAMA 2000; 283(15): 2008-12. [http://dx.doi.org/10.1001/jama.283.15.2008] [PMID: 10789670] ] guidelines (Stroup et al. 2000). PubMed, PsycInfo, Web of Science and Scopus databases were screened using search strategy: “(“dental anxiety” OR “dental phobia” OR “dental fear”) AND (“generalized anxiety disorder” OR “anxiety disorder” OR “panicdisorder” OR “agoraphobia” OR “social phobia” OR “specific phobia” OR “simple phobia” OR “phobia” OR “obsessive-compulsive disorder” OR“post-traumatic stress disorder” OR “mood disorder” OR “depression” OR “dysthymic disorder” OR “dysthymia” OR “bipolar disorder” OR“substance abuse” OR “substance dependence” OR “substance use disorder” OR “alcohol abuse” OR “alcohol dependence” OR “alcohol use disorder” OR “psychosis” OR “schizophrenia”)”. The last search was run on 25th of September 2015, except PsycInfo, of which the last run was made 28 Feb 2014 (due to availability). The search produced 1,132 results (PubMed 311, PsycINFO 70, Web of Science 278 and Scopus 473 hits). After duplications were removed, 631 unique publications were identified. First, the material was screened (HH and JN) on the basis of abstract, and if not available, a full-text article was obtained. Non-English articles were translated if necessary. Records thought to fulfill the inclusion criteria were labelled “yes” or “maybe” and full-text articles were obtained. A group of four unblind reviewers (authors) judged the material by using the 10-item checklist, scoring each from 0-1 points (see Appendix 1) modified from a checklist created for the assessment of randomised and non-randomised studies [22Downs SH, Black N. The feasibility of creating a checklist for the assessment of the methodological quality both of randomised and non-randomised studies of health care interventions. J Epidemiol Community Health 1998; 52(6): 377-84. [http://dx.doi.org/10.1136/jech.52.6.377] [PMID: 9764259] ]. Disagreements on the exclusion/inclusion of the record were resolved by consensus. Reference lists of accepted articles were then hand-checked for additional studies fulfilling the inclusion criteria (see the flowchart in Fig. 1 ). The material was accepted for review if the original study included the examination of comorbidity of dental fear with other specific phobias or psychiatric disorders and symptoms. The material was included if one or more of the following methods was used to evaluate dental anxiety: i) in general populations, the level of anxiety was measured by test or questionnaire, ii) if the study population consisted of (referred or self-referred) patients seeking treatment from a dental fear clinic, or iii) if the patients fulfilled the specific dental phobia criteria described in the ICD-10 [9World Health Organization. The ICD-10 classification of mental and behavioral disorders Clinical descriptions and diagnostic guidelines 1992.] or DSM-III [23American psychiatric association. Diagnostic and statistical manual of mental disorders (DSM-III) 3rd ed. 3rd ed.1980.] / DSM-IV [10American Psychiatric Association. Diagnostic and statistical manual of mental disorders (DSM-IV) 4th ed. 4th ed.1994.]. We decided to exclude material if dental anxiety was self-reported by single item or question, since narrative and subjective experiences can mean almost any level of fear, and there is no effort to objectively evaluate the level of dental fear. In the same manner, we accepted the material if comorbid phobias and disorders were studied i) using a test, ii) a self-report questionnaire(s) or iii) a psychiatric clinical interview according to ICD-10 or DSM-III/DSM-IV criteria. We decided to include the material if the study populations consisted only of adult patients or other individuals. The age limit was set at 18 years. Case reports and treatment considerations were excluded from the review. We also excluded all studies in an effort to explain the origin of dental anxiety if the comorbidity was not examined in the original study. In order to reduce publication bias, no limits were set to publication language or year. If the original study included both cases and controls, the difference between comorbid diagnoses and /or the severity of symptoms was compared between the groups. If only cases were included, we then evaluated how dental anxiety was associated with other symptoms and also estimated the level of comorbid diagnoses. In population-based studies, the association of the dental anxiety/phobia with other psychiatric diagnoses and symptoms was estimated. The effect size estimates (Cohen’s d values, correlations or odds ratios) in each study were categorised as small (*), moderate (**) and large (***) effects, based on the cut-offs presented by Rosenthal [24Rosenthal JA. Qualitative descriptors of strength of association and effect size. J Soc Serv Res 1996; 21(4)[http://dx.doi.org/10.1300/J079v21n04_02] ]. For the cut-offs used, see Table 2. The search produced 631 hits, of which, 16 unique articles fulfilled the inclusion criteria and were reviewed (see the flowchart in Fig. 1 ). Finally, all of these were in English. The most common reasons for exclusion were that no tests/interviews were used or that the comorbidity was not examined in the article. In the articles reviewed, five different structured tests (see Appendix 2) were used to measure dental anxiety; the Dental Anxiety Scale DAS [25Corah NL. Development of a dental anxiety scale. J Dent Res 1969; 48(4): 596. [http://dx.doi.org/10.1177/00220345690480041801] [PMID: 5256508] ], the Dental Beliefs Survey [26Milgrom P, Weinstein P, Kleinknecht RA, Getz T. Treating fearful dental patients: A clinical handbook 1985. ], the Dental Fear Survey [27Kleinknecht RA, Klepac RK, Alexander LD. Origins and characteristics of fear of dentistry. J Am Dent Assoc 1973; 86(4): 842-8. [http://dx.doi.org/10.14219/jada.archive.1973.0165] [PMID: 4511174] ], the Gatchel Fear Scale [28Gatchel RJ. The prevalence of dental fear and avoidance: Expanded adult and recent adolescent surveys. J Am Dent Assoc 1989; 118(5): 591-3. [http://dx.doi.org/10.14219/jada.archive.1989.0068] [PMID: 2785546] ] and the Modified Dental Anxiety Scale MDAS [29Freeman R, Clarke HMM, Humphris GM. Conversion tables for the corah and modified dental anxiety scales. Community Dent Health 2007; 24(1): 49-54. [PMID: 17405471] ]. A total of 20 tests were used to evaluate comorbid phobias and disorders. In three of the studies [12Roy-Byrne P, Milgrom P, Katon W. Psychopathology and psychiatric diagnosis in subjects with dental phobia. J Anx Dis 1994; 8(1): 19-31. [http://dx.doi.org/10.1016/0887-6185(94)90020-5] , 31Moore R, Brødsgaard I. Differential diagnosis of odontophobic patients using the DSM-IV. Eur J Oral Sci 1995; 103(2 ( Pt 1)): 121-6. [http://dx.doi.org/10.1111/j.1600-0722.1995.tb00129.x] [PMID: 7767707] , 33Hägglin C, Hakeberg M, Hällström T, et al. Dental anxiety in relation to mental health and personality factors. A longitudinal study of middle-aged and elderly women. Eur J Oral Sci 2001; 109(1): 27-33. [http://dx.doi.org/10.1034/j.1600-0722.2001.00946.x] [PMID: 11330931] ], clinical interviews were used. The articles reviewed included a total of 6,486 adult patients, students, volunteers and other participants. Study populations were heterogeneous; patients were collected from birth cohort studies (two articles), dental fear clinics (eight articles), randomly selected volunteers (three articles) and three other populations; university students (one article), university employees population (one article) and patients scheduled for an appointment at university dental clinic (one article). Dental anxiety was significantly correlated with agoraphobia [2Locker D, Poulton R, Thomson WM. Psychological disorders and dental anxiety in a young adult population. Community Dent Oral Epidemiol 2001; 29(6): 456-63. [http://dx.doi.org/10.1034/j.1600-0528.2001.290607.x] [PMID: 11784289] , 3Locker D, Thomson WM, Poulton R. Psychological disorder, conditioning experiences, and the onset of dental anxiety in early adulthood. J Dent Res 2001; 80(6): 1588-92. [http://dx.doi.org/10.1177/00220345010800062201] [PMID: 11499519] , 11Locker D, Shapiro D, Liddell A. Overlap between dental anxiety and blood-injury fears: Psychological characteristics and response to dental treatment. Behav Res Ther 1997; 35(7): 583-90. [http://dx.doi.org/10.1016/S0005-7967(97)00016-8] [PMID: 9193122] , 30Aartman IHA, de Jongh A, van der Meulen MJ. Psychological characteristics of patients applying for treatment in a dental fear clinic. Eur J Oral Sci 1997; 105(5 Pt 1): 384-8. [http://dx.doi.org/10.1111/j.1600-0722.1997.tb02134.x] [PMID: 9395098] ] and social phobia [2Locker D, Poulton R, Thomson WM. Psychological disorders and dental anxiety in a young adult population. Community Dent Oral Epidemiol 2001; 29(6): 456-63. [http://dx.doi.org/10.1034/j.1600-0528.2001.290607.x] [PMID: 11784289] , 3Locker D, Thomson WM, Poulton R. Psychological disorder, conditioning experiences, and the onset of dental anxiety in early adulthood. J Dent Res 2001; 80(6): 1588-92. [http://dx.doi.org/10.1177/00220345010800062201] [PMID: 11499519] , 13Tellez M, Kinner DG, Heimberg RG, Lim S, Ismail AI. Prevalence and correlates of dental anxiety in patients seeking dental care. Community Dent Oral Epidemiol 2015; 43(2): 135-42. [http://dx.doi.org/10.1111/cdoe.12132] [PMID: 25346261] , 31Moore R, Brødsgaard I. Differential diagnosis of odontophobic patients using the DSM-IV. Eur J Oral Sci 1995; 103(2 ( Pt 1)): 121-6. [http://dx.doi.org/10.1111/j.1600-0722.1995.tb00129.x] [PMID: 7767707] ]. The association between dental anxiety and various specific (simple) phobias was found in seven studies of which the effect size was strong (***) in five: DeJongh [32De Jongh A, Bongaarts G, Vermeule I, Visser K, De Vos P, Makkes P. Blood-injury-injection phobia and dental phobia. Behav Res Ther 1998; 36(10): 971-82. [http://dx.doi.org/10.1016/S0005-7967(98)00064-3] [PMID: 9714947] ] et al. 1998***, Hägglin [33Hägglin C, Hakeberg M, Hällström T, et al. Dental anxiety in relation to mental health and personality factors. A longitudinal study of middle-aged and elderly women. Eur J Oral Sci 2001; 109(1): 27-33. [http://dx.doi.org/10.1034/j.1600-0722.2001.00946.x] [PMID: 11330931] ] et al. 2001***, Locker [11Locker D, Shapiro D, Liddell A. Overlap between dental anxiety and blood-injury fears: Psychological characteristics and response to dental treatment. Behav Res Ther 1997; 35(7): 583-90. [http://dx.doi.org/10.1016/S0005-7967(97)00016-8] [PMID: 9193122] ] et al. 1997***, Locker [2Locker D, Poulton R, Thomson WM. Psychological disorders and dental anxiety in a young adult population. Community Dent Oral Epidemiol 2001; 29(6): 456-63. [http://dx.doi.org/10.1034/j.1600-0528.2001.290607.x] [PMID: 11784289] , 3Locker D, Thomson WM, Poulton R. Psychological disorder, conditioning experiences, and the onset of dental anxiety in early adulthood. J Dent Res 2001; 80(6): 1588-92. [http://dx.doi.org/10.1177/00220345010800062201] [PMID: 11499519] ] et al. 2001, Moore [31Moore R, Brødsgaard I. Differential diagnosis of odontophobic patients using the DSM-IV. Eur J Oral Sci 1995; 103(2 ( Pt 1)): 121-6. [http://dx.doi.org/10.1111/j.1600-0722.1995.tb00129.x] [PMID: 7767707] ] et al. 1995, Roy-Byrne [12Roy-Byrne P, Milgrom P, Katon W. Psychopathology and psychiatric diagnosis in subjects with dental phobia. J Anx Dis 1994; 8(1): 19-31. [http://dx.doi.org/10.1016/0887-6185(94)90020-5] ] et al. 1994***, Tellez [13Tellez M, Kinner DG, Heimberg RG, Lim S, Ismail AI. Prevalence and correlates of dental anxiety in patients seeking dental care. Community Dent Oral Epidemiol 2015; 43(2): 135-42. [http://dx.doi.org/10.1111/cdoe.12132] [PMID: 25346261] ] 2015***. The results showed that the prevalence of co-existing simple phobia can be up to 45% [12Roy-Byrne P, Milgrom P, Katon W. Psychopathology and psychiatric diagnosis in subjects with dental phobia. J Anx Dis 1994; 8(1): 19-31. [http://dx.doi.org/10.1016/0887-6185(94)90020-5] ]. The results were equal in patients of special dental fear clinics and with patients from birth cohort studies or selected randomly and then compared to the normative population. Results also had a similar degree of associations with comorbidity in different populations in studies of dental anxiety and comorbid psychiatric disorders Tables 1a and b. Dental anxiety and comorbid phobias and psychiatric symptoms. Control groups were included in the original studies. Dental anxiety had a significant positive correlation to depression and mood disorders in four population-based studies [2Locker D, Poulton R, Thomson WM. Psychological disorders and dental anxiety in a young adult population. Community Dent Oral Epidemiol 2001; 29(6): 456-63. [http://dx.doi.org/10.1034/j.1600-0528.2001.290607.x] [PMID: 11784289] , 3Locker D, Thomson WM, Poulton R. Psychological disorder, conditioning experiences, and the onset of dental anxiety in early adulthood. J Dent Res 2001; 80(6): 1588-92. [http://dx.doi.org/10.1177/00220345010800062201] [PMID: 11499519] , 33Hägglin C, Hakeberg M, Hällström T, et al. Dental anxiety in relation to mental health and personality factors. A longitudinal study of middle-aged and elderly women. Eur J Oral Sci 2001; 109(1): 27-33. [http://dx.doi.org/10.1034/j.1600-0722.2001.00946.x] [PMID: 11330931] , 35Kaakko T, Milgrom P, Coldwell SE, Getz T, Weinstein P, Ramsay DS. Dental fear among university employees: Implications for dental education. J Dent Educ 1998; 62(6): 415-20. [PMID: 9698696] ] and in four studies of dentally fearful patients [12Roy-Byrne P, Milgrom P, Katon W. Psychopathology and psychiatric diagnosis in subjects with dental phobia. J Anx Dis 1994; 8(1): 19-31. [http://dx.doi.org/10.1016/0887-6185(94)90020-5] , 30Aartman IHA, de Jongh A, van der Meulen MJ. Psychological characteristics of patients applying for treatment in a dental fear clinic. Eur J Oral Sci 1997; 105(5 Pt 1): 384-8. [http://dx.doi.org/10.1111/j.1600-0722.1997.tb02134.x] [PMID: 9395098] , 36Hakeberg M, Hägglin C, Berggren U, Carlsson SG. Structural relationships of dental anxiety, mood, and general anxiety. Acta Odontol Scand 2001; 59(2): 99-103. [http://dx.doi.org/10.1080/000163501750157252] [PMID: 11370758] , 37Pekkan G, Kilicoglu A, Hatipoglu H. Relationship between dental anxiety, general anxiety level and depression in patients attending a university hospital dental clinic in Turkey. Community Dent Health 2011; 28(2): 149-53. [PMID: 21780354] ]. The positive association between dental anxiety and (other) anxiety disorders was found in a total of nine studies, and, in five of them, the association was found to be strong (***): Aartman [30Aartman IHA, de Jongh A, van der Meulen MJ. Psychological characteristics of patients applying for treatment in a dental fear clinic. Eur J Oral Sci 1997; 105(5 Pt 1): 384-8. [http://dx.doi.org/10.1111/j.1600-0722.1997.tb02134.x] [PMID: 9395098] ] et al. 1997***, DeJongh [32De Jongh A, Bongaarts G, Vermeule I, Visser K, De Vos P, Makkes P. Blood-injury-injection phobia and dental phobia. Behav Res Ther 1998; 36(10): 971-82. [http://dx.doi.org/10.1016/S0005-7967(98)00064-3] [PMID: 9714947] ] et al. 1998***, Hakeberg [36Hakeberg M, Hägglin C, Berggren U, Carlsson SG. Structural relationships of dental anxiety, mood, and general anxiety. Acta Odontol Scand 2001; 59(2): 99-103. [http://dx.doi.org/10.1080/000163501750157252] [PMID: 11370758] ] et al. 2001***, Halonen [34Halonen H, Salo T, Hakko H, Räsänen P. The association between dental anxiety, general clinical anxiety and depression among finnish university students. Oral Health Dent Manag 2014; 13(2): 320-5. [PMID: 24984641] ] et al. 2014***, Hägglin [33Hägglin C, Hakeberg M, Hällström T, et al. Dental anxiety in relation to mental health and personality factors. A longitudinal study of middle-aged and elderly women. Eur J Oral Sci 2001; 109(1): 27-33. [http://dx.doi.org/10.1034/j.1600-0722.2001.00946.x] [PMID: 11330931] ] et al. 2001, Kaakko [35Kaakko T, Milgrom P, Coldwell SE, Getz T, Weinstein P, Ramsay DS. Dental fear among university employees: Implications for dental education. J Dent Educ 1998; 62(6): 415-20. [PMID: 9698696] ] et al. 1998, Locker [2Locker D, Poulton R, Thomson WM. Psychological disorders and dental anxiety in a young adult population. Community Dent Oral Epidemiol 2001; 29(6): 456-63. [http://dx.doi.org/10.1034/j.1600-0528.2001.290607.x] [PMID: 11784289] , 3Locker D, Thomson WM, Poulton R. Psychological disorder, conditioning experiences, and the onset of dental anxiety in early adulthood. J Dent Res 2001; 80(6): 1588-92. [http://dx.doi.org/10.1177/00220345010800062201] [PMID: 11499519] ] et al. 2001***, Pekkan [37Pekkan G, Kilicoglu A, Hatipoglu H. Relationship between dental anxiety, general anxiety level and depression in patients attending a university hospital dental clinic in Turkey. Community Dent Health 2011; 28(2): 149-53. [PMID: 21780354] ] et al. 2011 and Roy-Byrne [12Roy-Byrne P, Milgrom P, Katon W. Psychopathology and psychiatric diagnosis in subjects with dental phobia. J Anx Dis 1994; 8(1): 19-31. [http://dx.doi.org/10.1016/0887-6185(94)90020-5] ] et al. 1994 (for cut-offs used in effect size estimates, see Table 2. Five of these were studies of dentally fearful patients. The association between dental anxiety and generalised anxiety disorder was found in one study [31Moore R, Brødsgaard I. Differential diagnosis of odontophobic patients using the DSM-IV. Eur J Oral Sci 1995; 103(2 ( Pt 1)): 121-6. [http://dx.doi.org/10.1111/j.1600-0722.1995.tb00129.x] [PMID: 7767707] ]. Other significant comorbid findings included alcohol and substance use disorder [2Locker D, Poulton R, Thomson WM. Psychological disorders and dental anxiety in a young adult population. Community Dent Oral Epidemiol 2001; 29(6): 456-63. [http://dx.doi.org/10.1034/j.1600-0528.2001.290607.x] [PMID: 11784289] , 3Locker D, Thomson WM, Poulton R. Psychological disorder, conditioning experiences, and the onset of dental anxiety in early adulthood. J Dent Res 2001; 80(6): 1588-92. [http://dx.doi.org/10.1177/00220345010800062201] [PMID: 11499519] , 12Roy-Byrne P, Milgrom P, Katon W. Psychopathology and psychiatric diagnosis in subjects with dental phobia. J Anx Dis 1994; 8(1): 19-31. [http://dx.doi.org/10.1016/0887-6185(94)90020-5] ], and, also other DSM-IV Axis I disorders [2Locker D, Poulton R, Thomson WM. Psychological disorders and dental anxiety in a young adult population. Community Dent Oral Epidemiol 2001; 29(6): 456-63. [http://dx.doi.org/10.1034/j.1600-0528.2001.290607.x] [PMID: 11784289] , 3Locker D, Thomson WM, Poulton R. Psychological disorder, conditioning experiences, and the onset of dental anxiety in early adulthood. J Dent Res 2001; 80(6): 1588-92. [http://dx.doi.org/10.1177/00220345010800062201] [PMID: 11499519] , 11Locker D, Shapiro D, Liddell A. Overlap between dental anxiety and blood-injury fears: Psychological characteristics and response to dental treatment. Behav Res Ther 1997; 35(7): 583-90. [http://dx.doi.org/10.1016/S0005-7967(97)00016-8] [PMID: 9193122] , 30Aartman IHA, de Jongh A, van der Meulen MJ. Psychological characteristics of patients applying for treatment in a dental fear clinic. Eur J Oral Sci 1997; 105(5 Pt 1): 384-8. [http://dx.doi.org/10.1111/j.1600-0722.1997.tb02134.x] [PMID: 9395098] , 33Hägglin C, Hakeberg M, Hällström T, et al. Dental anxiety in relation to mental health and personality factors. A longitudinal study of middle-aged and elderly women. Eur J Oral Sci 2001; 109(1): 27-33. [http://dx.doi.org/10.1034/j.1600-0722.2001.00946.x] [PMID: 11330931] ]. Dental anxiety and comorbid psychiatric symptoms and disorders. No control groups. The comorbid diagnoses and psychiatric symptoms were found equally in population-based studies and in studies with patients of dental fear clinics Table 2. Some main findings emerged, however. The most common comorbid finding with association with dental fear was anxiety-related disorders; a positive correlation was found in one birth cohort study, two randomly selected populations, one university student volunteer population, a total of four populations of special dental fear clinic patients and one population of patients seeking treatment at a university dental clinic. Summary of results. The findings were classified as diagnoses if clinical interviews were used in the original study, and, if only tests were used, the findings were considered as symptoms (note: In Tellez 2015 a semi-structured clinical interview was administered by telephone, and the findings were considered as symptoms). The positive association of dental anxiety to depression and mood disorders was proven in eight different original studies (a total of three populations of a special dental fear clinic, one birth cohort study, two randomly selected populations, one university student volunteer population and one population of patients seeking treatment at a university dental clinic). Agoraphobia and social phobia were found to be associated with dental anxiety in three original studies, and, other specific (simple) phobias in seven studies. Commonly, patients with dental anxiety had more than one additional specific phobia; most common simple phobias were blood-injection-injury-related phobias. In all phobia subtypes, the association was found both in population-based and dental fear clinic patients. The gender difference was observed in seven articles. In all cases, women had more comorbidity between dental anxiety and general fears and phobias, depression and blood-injury fears than men [11Locker D, Shapiro D, Liddell A. Overlap between dental anxiety and blood-injury fears: Psychological characteristics and response to dental treatment. Behav Res Ther 1997; 35(7): 583-90. [http://dx.doi.org/10.1016/S0005-7967(97)00016-8] [PMID: 9193122] , 30Aartman IHA, de Jongh A, van der Meulen MJ. Psychological characteristics of patients applying for treatment in a dental fear clinic. Eur J Oral Sci 1997; 105(5 Pt 1): 384-8. [http://dx.doi.org/10.1111/j.1600-0722.1997.tb02134.x] [PMID: 9395098] , 32De Jongh A, Bongaarts G, Vermeule I, Visser K, De Vos P, Makkes P. Blood-injury-injection phobia and dental phobia. Behav Res Ther 1998; 36(10): 971-82. [http://dx.doi.org/10.1016/S0005-7967(98)00064-3] [PMID: 9714947] , 34Halonen H, Salo T, Hakko H, Räsänen P. The association between dental anxiety, general clinical anxiety and depression among finnish university students. Oral Health Dent Manag 2014; 13(2): 320-5. [PMID: 24984641] , 37Pekkan G, Kilicoglu A, Hatipoglu H. Relationship between dental anxiety, general anxiety level and depression in patients attending a university hospital dental clinic in Turkey. Community Dent Health 2011; 28(2): 149-53. [PMID: 21780354] -39Berggren U, Carlsson SG, Gustafsson J-E, Hakeberg M. Factor analysis and reduction of a fear survey schedule among dental phobic patients. Eur J Oral Sci 1995; 103(5): 331-8. [http://dx.doi.org/10.1111/j.1600-0722.1995.tb00035.x] [PMID: 8521126] ]. Even though the type of representation of the results was scattered in the original articles, these findings were coherent in all studies, thus enhancing the idea of similarity between dental fear and these factors. In only three different studies [12Roy-Byrne P, Milgrom P, Katon W. Psychopathology and psychiatric diagnosis in subjects with dental phobia. J Anx Dis 1994; 8(1): 19-31. [http://dx.doi.org/10.1016/0887-6185(94)90020-5] , 31Moore R, Brødsgaard I. Differential diagnosis of odontophobic patients using the DSM-IV. Eur J Oral Sci 1995; 103(2 ( Pt 1)): 121-6. [http://dx.doi.org/10.1111/j.1600-0722.1995.tb00129.x] [PMID: 7767707] , 33Hägglin C, Hakeberg M, Hällström T, et al. Dental anxiety in relation to mental health and personality factors. A longitudinal study of middle-aged and elderly women. Eur J Oral Sci 2001; 109(1): 27-33. [http://dx.doi.org/10.1034/j.1600-0722.2001.00946.x] [PMID: 11330931] ] were clinical interviews used, while the others were based only on the use of different questionnaires, which brings some criticism to the interpretation of the results. However, the main findings were quite similar between these two methods; except generalized anxiety disorder, which was only found in a clinical interview-based study [31Moore R, Brødsgaard I. Differential diagnosis of odontophobic patients using the DSM-IV. Eur J Oral Sci 1995; 103(2 ( Pt 1)): 121-6. [http://dx.doi.org/10.1111/j.1600-0722.1995.tb00129.x] [PMID: 7767707] ], and agoraphobia, found in three questionnaire-based studies [2Locker D, Poulton R, Thomson WM. Psychological disorders and dental anxiety in a young adult population. Community Dent Oral Epidemiol 2001; 29(6): 456-63. [http://dx.doi.org/10.1034/j.1600-0528.2001.290607.x] [PMID: 11784289] , 3Locker D, Thomson WM, Poulton R. Psychological disorder, conditioning experiences, and the onset of dental anxiety in early adulthood. J Dent Res 2001; 80(6): 1588-92. [http://dx.doi.org/10.1177/00220345010800062201] [PMID: 11499519] , 11Locker D, Shapiro D, Liddell A. Overlap between dental anxiety and blood-injury fears: Psychological characteristics and response to dental treatment. Behav Res Ther 1997; 35(7): 583-90. [http://dx.doi.org/10.1016/S0005-7967(97)00016-8] [PMID: 9193122] , 30Aartman IHA, de Jongh A, van der Meulen MJ. Psychological characteristics of patients applying for treatment in a dental fear clinic. Eur J Oral Sci 1997; 105(5 Pt 1): 384-8. [http://dx.doi.org/10.1111/j.1600-0722.1997.tb02134.x] [PMID: 9395098] ]. The tests used partly overlap: Some psychiatric and specific phobia questionnaires also include scales to measure dental fear. Most tests used in original papers are known to be commonly used in clinical practice. The results also suggest that dental anxiety either increased or decreased in concert with the number of other fears [32De Jongh A, Bongaarts G, Vermeule I, Visser K, De Vos P, Makkes P. Blood-injury-injection phobia and dental phobia. Behav Res Ther 1998; 36(10): 971-82. [http://dx.doi.org/10.1016/S0005-7967(98)00064-3] [PMID: 9714947] ], and, in a longitudinal study [33Hägglin C, Hakeberg M, Hällström T, et al. Dental anxiety in relation to mental health and personality factors. A longitudinal study of middle-aged and elderly women. Eur J Oral Sci 2001; 109(1): 27-33. [http://dx.doi.org/10.1034/j.1600-0722.2001.00946.x] [PMID: 11330931] ] during the follow-up drop-outs had a higher level of dental fear (Table 1a). Some findings in the screening process and in clinical evaluation also support the results. For example, the personality trait neuroticism, understood as incapability to cope with psychological stress, is associated with dental anxiety and its maintenance over time [33Hägglin C, Hakeberg M, Hällström T, et al. Dental anxiety in relation to mental health and personality factors. A longitudinal study of middle-aged and elderly women. Eur J Oral Sci 2001; 109(1): 27-33. [http://dx.doi.org/10.1034/j.1600-0722.2001.00946.x] [PMID: 11330931] , 40Halonen H, Salo T, Hakko H, Räsänen P. Association of dental anxiety to personality traits in a general population sample of Finnish University students. Acta Odontol Scand 2012; 70(2): 96-100. [http://dx.doi.org/10.3109/00016357.2011.598182] [PMID: 21736513] , 41Lautch H. Dental phobia. Br J Psychiatry 1971; 119(549): 151-8. [http://dx.doi.org/10.1192/bjp.119.549.151] [PMID: 5565902] ]. Neuroticism is well known to be connected with (general) anxiety disorders, depression and substance use disorders. Some of the latest findings suggest that genetic factors play at least some role in the development of fear [42Ray J, Boman UW, Bodin L, Berggren U, Lichtenstein P, Broberg AG. Heritability of dental fear. J Dent Res 2010; 89(3): 297-301. [http://dx.doi.org/10.1177/0022034509356918] [PMID: 20075372] , 43Vassend O, Røysamb E, Nielsen CS. Dental anxiety in relation to neuroticism and pain sensitivity. A twin study. J Anxiety Disord 2011; 25(2): 302-8. [http://dx.doi.org/10.1016/j.janxdis.2010.09.015] [PMID: 21211939] ]. However, in order to limit the focus, we decided to exclude studies about personality traits, genetic factors and dental anxiety, since they best explain the origin, not comorbidity of dental fear. The number of articles identified was relatively low when taking into account a large number of studies on dental anxiety (the term “dental anxiety” produced over 4,000 hits in PubMed). The idea of similarity with other fears and a patient’s role in the acquisition of fear are quite new, and so is the psychological testing in the research work. In the evaluation process, many original articles were excluded because of the methodology, despite careful study design and patient selection. As far as we know, no previous systematic reviews of the comorbidity of dental anxiety to other psychiatric disorders and symptoms exist. The search strategy was very representative and thorough, including Axis I categories of mood disorders, anxiety disorders, substance-related and psychotic disorders. Although the number of articles was only a small minority of all search hits (about 2.5 percent), we believe that we have located all the relevant studies on the topic. The tests used in the original articles and even the aims of different studies were very heterogeneous. Because of this heterogeneity in methods, we decided not to pool the results for a meta-analysis, although this left us a body of descriptive data for a systematic and critically review the articles. However, when possible, we estimated the magnitude of the effects. This heterogeneity was also a benefit; when the same result based on an ICD-10 or DSM-IV classification is made by multiple tests, it will increase the reliability of the results, thus lowering the bias. In the same manner, the heterogeneity of the study populations gave a representative and large sample of dentally anxious individuals. The limitation to the interpretation of our results is the question of how diagnoses were made and symptoms were assessed in the original papers. The diagnosis of (specific) dental phobia, as well as any other phobia, depression, or other disorder, is always made by a psychiatrist. A test, for example, for anxiety or depression inventory, can be used for research purposes, but it is not a clinical diagnosis. Only in a few of the papers reviewed were clinical interviews used. The prevalence of anxiety disorders in large national epidemiologic surveys [44Jacobi F, Höfler M, Siegert J, et al. Twelve-month prevalence, comorbidity and correlates of mental disorders in Germany: The mental health module of the german health interview and examination survey for adults (DEGS1-MH). Int J Methods Psychiatr Res 2014; 23(3): 304-19. [http://dx.doi.org/10.1002/mpr.1439] [PMID: 24729411] -46Slade T, Johnston A, Oakley Browne MA, Andrews G, Whiteford H. 2007 national survey of mental health and wellbeing: Methods and key findings. Aust N Z J Psychiatry 2009; 43(7): 594-605. [http://dx.doi.org/10.1080/00048670902970882] [PMID: 19530016] ] can vary between 14.4 and 18.1%, while the prevalence of mood disorders can be up to 9.5% [45Kessler RC, Chiu WT, Demler O, Merikangas KR, Walters EE. 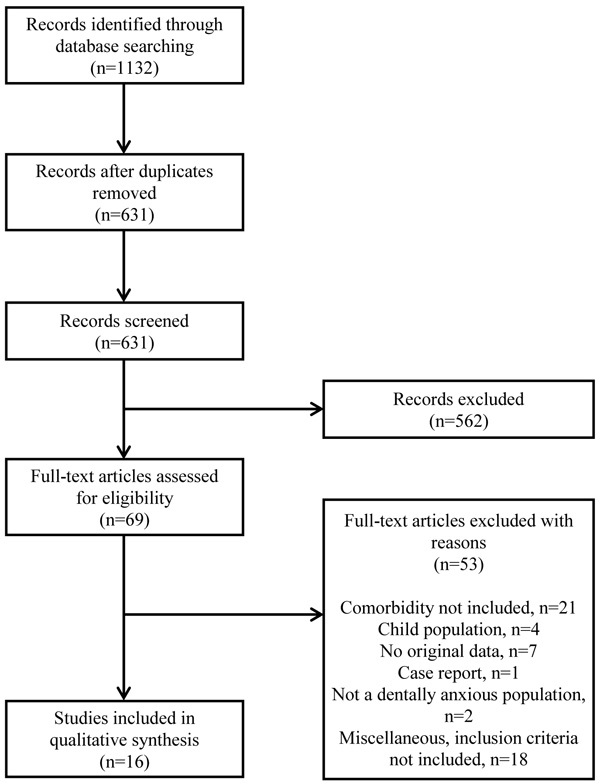 Prevalence, severity, and comorbidity of 12-month DSM-IV disorders in the national comorbidity survey replication. Arch Gen Psychiatry 2005; 62(6): 617-27. [http://dx.doi.org/10.1001/archpsyc.62.6.617] [PMID: 15939839] ]. If a control group is used in the original study, as was the case in eight (half) of the reviewed articles, the level of this “natural” co-existing anxiety/mood disorders can be evaluated and distinguished from the disorders associated with dental fear. However, in the other half of the articles, the control group was not used in the study, so the results must be interpreted carefully. Also, some of the original studies were cross-sectional and some had a longitudinal aspect, suggesting that there may be a trait (dental) anxiety and state (dental) anxiety involved. We were not able to study these separately from the articles included. Although no limits were set to publication language or year, with only a few exceptions, all the records identified through database searching were in English. This may be due to language bias in the databases. The results were relatively robust across all the articles, but it is possible that there exists some publication bias. It is possible that studies have been conducted in which the association was not found to be significant, but such studies have not been published or made available anywhere. A high level of dental anxiety (dental fear) has a strong positive correlation with a high level of other comorbid phobias, depression, mood disorders and other psychiatric disorders and symptoms. However, on the basis of the articles reviewed, it cannot be concluded whether patients with dental anxiety are more prone to have a high level of other psychiatric disorders, or whether other psychiatric conditions are the primary disorder predisposing a given individual to the development of dental anxiety. This brings a challenge to clinical work; how should a dentist manage a patient with dental anxiety, or should a patient be advised to consult a psychologist or a psychiatrist? Further examinations are needed. This research received no specific grant from any funding agency in the public, commercial, or not-for-profit sectors. Professor Jouko Miettunen was supported by the Academy of Finland (#268336). The authors declare that they have contributed equally to the design, execution, analyses, and writing of the paper and that all authors have seen and approved the final version of the paper. Note: In many of the reviewed papers authors used a translated version(s) of the tests. For further information, see the original articles. (If the answer to the question is YES, log it as 1 point, if NO, log it as 0 points). Is the hypothesis / aim / objective of the study clearly described? Are the main outcomes to be measured clearly described in the Introduction or Methods section? Are the characteristics of the patients included in the study clearly described? Are the interventions of interest clearly described? Are the main findings of the study clearly described? Have all the important adverse events that may be a consequence of the intervention been reported? Were the subjects asked to participate in the study representative of the entire population from which they were recruited? Were the statistical tests used to assess the main outcomes appropriate? Were the main outcome measures used accurate (valid and reliable)? Were the patients in different intervention groups (trials and cohort studies) or were the cases and controls (case-control studies) recruited from the same population? Was there adequate adjustment for confounding in the analyses from which the main findings were drawn? Were losses of patients to follow-up taken into account? Description of the tests used to measure dental anxiety in reviewed articles. All tests are widely used in clinical and research practice. World Health Organization. The ICD-10 classification of mental and behavioral disorders Clinical descriptions and diagnostic guidelines 1992. American Psychiatric Association. Diagnostic and statistical manual of mental disorders (DSM-IV) 4th ed. 4th ed.1994. Schatzberg AF, Samson JA, Rothschild AJ, Bond TC, Regier DA. McLean hospital depression research facility: Earlyonset phobic disorders and adult-onset major depression. Br J Psychiatry 1998; 173: 29-34. American psychiatric association. Diagnostic and statistical manual of mental disorders (DSM-III) 3rd ed. 3rd ed.1980. Milgrom P, Weinstein P, Kleinknecht RA, Getz T. Treating fearful dental patients: A clinical handbook 1985. Degoratis LR. SLC-90: Administration, scoring and procedures manual -I for the (revised) version 1977. Spielberg CD, Gorsuch RC, Lushene RE. Manual for the state-trait-anxiety inventory 1970.